Whether you're going to dance, drink or people-watch, you can have a good time at a Gothic club even if you're not decked out in leather or spikes. Good music, strong drinks and an open dance floor all lend themselves to an interesting evening, and the environment tends to be accepting of different kinds of people. If you think the environment at a Gothic club will be dark and dreary, you might be surprised. In many areas, the Goth scene is sort of a community unto itself, where self-expression and individuality are prized. Don't expect everyone to be either depressed or wildly dressed; a lot of people are just there to enjoy the music and see their friends. There's less of a "club" atmosphere than at some other venues, and Goth clubs often have good places to sit and converse. For any Gothic club, basic black is a good choice, even if it's just jeans and a T-shirt. Goth culture also encourages flamboyant fashion, elaborate costumes and wild makeup and jewelry. While the color scheme does tend toward the dark side, bright colors are acceptable as well. Wear what feels comfortable or appropriate to you. Gothic clubs allow you to come as you are, whether it's dressed-up or dressed-down. The music at Gothic clubs is selected for dancing. Expect bands like Depeche Mode, the Cure and a lot of New Wave and 1980s music. Unlike other types of clubs, not everyone will be out dancing, but it's certainly acceptable to get out there and shake it. Gothic dancing often involves a lot of fluid arm movement; expressing yourself through movement is more important at a Goth club than knowing "steps" or adhering to any particular style. The Goth scene sometimes attracts people who have grown up feeling like outcasts. 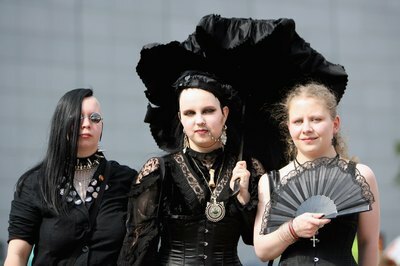 This means that Goth events are often a place where you can explore different styles of dress, dance and self-expression. The mood is often low-key, with a wide variety in what people wear, what sort of music is played and the things people choose to do while at the club. Gothic clubs are a place to be yourself, dress up -- and have fun.